Arbitration is a clause that is found in most Credit Card Agreements. Your Card Agreement will state that you may use either AAA or JAMS as the arbitration firm. The Card Agreement may also state something about who pays for arbitration. It may say that "they" (the OC or JDB) will pay all of your filing fees. This means arbitration will cost you a grand total of $0, while the creditor will be billed a minimum of $5,000 to complete an arbitration (and many times that price can climb much higher). However, even if your arbitration clause is silent on costs, the rules of the arbitration firm cap all consumer fees at $200 for AAA and $250 for JAMS. This means you would never pay more than $250 max, while the company will still be paying many thousands to arbitrate. Just due to this cost structure alone, almost all JDBs will refuse to arbitrate. This is why getting your case out of court and into arbitration - especially when facing a JDB - is almost like having a golden ticket to a win. Of course, like everything there is no guarantee. However, the odds are strongly in your favor with arbitration against a JDB. (If you are dealing with an OC - especially a big bank like Discover or AmEx - then your arbitration experience and strategy will be much different than with a debt collector JDB like Midland or Cavalry. More details on differences in taking an OC bank to arbitration are below). 1. It's not a Bluff, it's arbitration - You are going to ask the court to move your case to arbitration because that is the proper forum per the card agreement. This is not a "bluff" to scare off the JDB. This is a strategy that must be followed through with. It is ok if the JDB does not magically drop the case just at the mention of arbitration. The JDB will continue to work the case as if arbitration was never said, even after you file a Motion to Compel Arbitration in court. The JDB may even pay the initial filing fee of $900 to follow you into arbitration once you start the case. However, soon after that $900 filing fee, the JDB will be sent a first arbitrator retainer bill of about $5,000. This is why you continue arbitration. You are not bluffing, because your case is the same in arbitration as it was in court. You will be making the same arguments and have about the same chance of winning on those arguments (slim, in all honesty). The big difference here is that the JDB must now pay large sums along the way to allow this to happen. So you are not bluffing, you are just moving your case into a forum that they do not like and which forces them to make a cost/reward analysis on whether to continue the case or not. 2. Settlement Opportunities - The goal of arbitration is to create a situation that gives you the best settlement advantage (i.e. settling for $0 with a mutual dismissal with prejudice). There are 3 key points where this comes into play. #1 - After the court grants your MTC and before the JDB pays the $900 filing fee to the arbitration firm. #2 - after the JDB pays the filing fee but before their $5,000 retainer is due (after the arbitrator is chosen). #3 - After the first conference call and before the discovery deadline, just before the hearing where another large retainer bill is due. If the JDB does not reach out first to talk settlement, these are the points I would send an email letting them know I am willing to offer a mutual dismissal with prejudice (minimum). Do not forget to always include an expiration date for your settlement offer. I like to make my offers expire on the same day the next event is due (i.e. a payment deadline for them to pay the arbitration fees, or the discovery deadline date, etc). If they do not agree to your offer, or counter for a higher amount you can not or are not willing to pay, then I just decline the offer and allow arbitration to proceed to the next step until you get to the next key settlement point where I make my same offer again with a new expiration date. 3. Object. Object. Object. - In arbitration, if you do not object to something in writing you lose your right to it. Therefore, anything that happens that falls outside the arbitration rules and especially the supplemental consumer rules, you must object in an email to the arbitrator and CC'd the JDB attorney. Objections not only preserve your rights under the consumer rules, but they also can create side issues that must be dealt with by the arbitrator. The arbitrator's hourly rate to respond to these side issues can really eat up the JDB's $5k retainer before you even get to discovery. Especially if you have phone hearings on these side issues (HINT: always ask for a phone hearing as part of an objection). This causes arbitration to be slow and expensive, which can position you into a better settlement opportunity. 4. Initial Conference Call - This first call once the arbitrator is appointed is where you can set the tone to let the other side know that you are not bluffing and you mean business. They should come away from the call knowing very well that you intend to see this case all the way through to the final hearing (even if you really don't want to). This call is usually fairly quick and informal. It is designed to set the scheduling of discovery and a hearing date. However, you should assert some things during the call that tips the other side into knowing it will not be an easy push over win like they would have in court. I would ask the arbitrator for the other side to submit the name of their witness they will bring to the hearing with personal knowledge of the alleged account. If not already covered by the arbitrator, I would ask for an in person hearing. I would be prepared to give a time-frame when the arbitrator asks how long you will need to present your case at the hearing (I would say at least half a day - aprox 3 - 4 hours). 5. What About an OC? - If you are dealing with an Original Creditor (not a JDB) they may take the arbitration all the way through to the final hearing. Money is far less of an issue with the big banks, and unlike a JDB, these banks are not counting on collections as their sole source of income. Therefore, the OC banks will proceed with arbitration with much less trepidation than a JDB, so you must modify your strategy and expectations. With some OC's, they will never agree to a mutual walk away, however, using arbitration may help you get a much cheaper settlement offer than you would by staying in court. My goal with an OC would be to use the long, slow arbitration process to buy some time to save up a lump sum to offer them for settlement. You can use the same settlment opportunity points as yo would with a JDB, but instead of "mutual dismissal", your offer may be to pay 50% of the debt, for instance (or what you can realistically offer as a lump sum payment) in exchange for a dismissal of their court case against you. If you can't come to an agreement and go to the hearing and "lose" the final hearing with an OC, check your card agreement for any arbitration appeal language. Some OCs like Discover and AmEx have an appeal option written into the contract. The appeal is before a 3-arbiter panel. This means the arbitration process starts all over again, only this time you have 3-arbitrators which triples the bank's costs. This is where arbitration costs can skyrocket well over $100,000. After you file an appeal and get 3 arbitrators appointed, this is likely the best settlement opportunity with an OC. (when they are staring at a new $20k initial arbitrator retainer bill after just paying around $10k - 20k for the first arbitration in total). In court, the important thing to remember is when you are asking for arbitration, you effectively put everything about the alleged debt and account in the back seat. You are saying that the court has no jurisdiction to hear this subject and that it is for arbitration only. Therefore, do not fall into the creditor attorney's trap of trying to continually bring back up the debt and anything related to it. Do not answer their questions prior to going in front of the judge about the debt. Instead you just assert that it is a matter for arbitration and you will be asking the court to grant your MTC. When facing the judge, they may talk to the attorney first who will go into the information about the debt. Just wait for your turn to speak and state that you have a pending MTC that speaks to jurisdiction and that you would like to have that heard first before getting into the merits of the case. Getting a granted MTC is like a golden ticket against a JDB. This should be ALL that you focus on in court. When you file the MTC you essentially put a wrench into the JDB's auto-pilot lawsuit mill. The ONLY question now before the court is whether there is a valid arbitration agreement between the parties (you will show that there is with your card agreement and affidavit). And if there is found to be a valid arbitration clause, then according to case law (from state and SCOTUS), then the court MUST order arbitration. This is the one and only issue that should be covered in court. AFTER the court grants your MTC and orders the parties to arbitrate, then you should move on to actually filing the case in arbitration. VERY IMPORTANT NOTE: Before doing anything in court, you should look up (or get a copy from the court) your local court rules! All courts have their own set of rules and it is impossible for anyone on this board to know for certain your specific court's rules. You especially want to read the rules on filing an answer and filing a motion and be sure you are complying with those rules (and time-frames) when you are taking these actions in court. When you are sued, you are required to answer the lawsuit within a certain time-frame. That time-frame is different for each court, according to the rules of that court, but a general time is between 20-30 days. In some courts, you are allowed to file a Motion in place of an answer. However, in this thread, I suggest filing an answer WITH your Motion to Compel Arbitration (MTC). This is not a requirement, but it may change this one element in your case: Filing a MTC only (in place of an answer) allows the Plaintiff to dismiss the case without prejudice on their own before the MTC is ruled on by the judge. However, if you have filed an Answer AND the MTC, most courts do not allow the Plaintiff to dismiss the case on their own and they would need to get your cooperation to file a joint stipulated dismissal. When that happens, you have the right to tell the attorney that you will only agree to a dismissal WITH prejudice (and this permanently puts an end to your case and the alleged debt too). Very Important Note: It is imperative that when you file an answer, you mention arbitration as a defense. In some states, if you do not raise arbitration as part of the answer, the court can rule that you waived your right to arbitration. In your answer, after you deny all allegations in the complaint, you should create a new section with the following title: “Affirmative Defense”. Under this heading you will state “Lack of Subject Matter Jurisdiction – The underlying contract contains a private arbitration clause which the Defendant has elected to exercise. Therefore, This Court does not have jurisdiction to hear this matter”. Along with your MTC it is generally a good idea to include an affidavit that testifies that the included Card Agreement you are submitting is a "true and correct copy of the contract that governs the account from which Plaintiff's allegations arise". A quick google search will show you how an affidavit should be formatted and worded. It does not have to be complicated or special, it just has to be your own words stating you have the correct card agreement. The Affidavit should be notarized before filing with the court. This is the only document that is necessary to notarize, as it is a sworn statement. Having the affidavit is also a good way to counter the most common argument a creditor will make against your MTC, by saying you have the wrong card agreement. Your affidavit is your sworn testimony and the only way to counter this is for the Plaintiff to present a witness with knowledge of the bank's card agreements during the time your account was active. (In other words, it would have to be sworn testimony from the Bank itself, and not the JDB or the attorney's word). Because of this, your affidavit usually eliminates any doubt that the Card Agreement is accurate and valid. This answer and your MTC can be filed at the same time. However, if you are up against the deadline to file an answer, the answer is the most important element to avoid a default judgement. The answer should be a short and easy document to file, so get that done first if pressed for time. You may then file the MTC a week or two later (as soon as you can, but no later than allowed by the court rules). Some courts require that you set a hearing date for your MTC. If your court requires this, make sure you do this at the time you file. In some instances, you may be required to contact the other side's attorney to work out a date for a hearing after you file the MTC. Make sure you know your court's rule on setting up a hearing. Some courts automatically schedule a hearing for you, and in some cases the judge will rule on your motion without a hearing at all. This is a matter of a court by court basis as they all operate in their own way with their own rules. Checking court rules on filing motions is essential. Go to the website of either AAA or JAMS, depending on which one your card agreement mentions. Find the document titled "Demand for Arbitration". The instructions for filing are at the top of this Demand form. Remember that you are filing for CONSUMER arbitration, so follow the instructions for CONSUMER cases. When filing arbitration, I very strongly recommend filing some claim against the JDB. Remember that when you ask for arbitration and file it, you have now flipped the roles. YOU are the "Claimant" and THEY are the "respondent". This is essentially like you are now "suing" the JDB, only in arbitration instead of court. Think of it just like that. You would not file a lawsuit against yourself, so do not do it in arbitration. I would never mention THEIR claims against me, nor the debt in any way. Instead, I only file MY claims against the JDB. Do not worry at this stage about the details of your claims because this initial claim is allowed to be changed, added to or dropped at any time before an arbitrator is assigned to the case (and even after, you can still make changes with the arbitrator's permission). If you have nothing very strong with proof against the JDB, I would file with something such as "violations of state and federal consumer debt collection laws" or perhaps, "Violation of the Fair Debt Collection Practices Act", etc. Or even a simple "Billing dispute" will do if you have no violations of law against them. Again, it doesn't need to be more detailed then that at this stage and if your claims never pan out, you have the ability to drop them later (or you may find NEW claims to add if the JDB violates the laws during the ongoing case). When sending in the Demand for Arbitration, I never send money initially. If you are required to pay the $200/$250 consumer filing fee (or any portion of it), then the arbitration firm will tell you to submit that in order to continue. They will never reject your filing, but will send you a case number and request for payment to move forward. Having the case number is key evidence that you filed the case (which may be needed for Court later). If the Card Agreement states that "they" will pay for your filing fee, I will include a cover letter with my Demand form stating that per the Agreement you are asking the company to forward the consumer filing fee directly to AAA/JAMS. Also when sending the Demand, I send it to AAA/JAMS and to the attorney for the JDB at the same time. I send both CMRRR and retain the green cards. Although the Demand Form instructions say that proof of service is needed, I simply include a "certificate of service" with my forms that states that I certify that I sent a copy to the JDB by USPS Certified Mail. If there is ever a question about service after I file, I will have the green card to submit as proof if needed. Remember, that this is now YOUR case against the JDB. It will be up to the JDB to file a COUNTER CLAIM in arbitration for the alleged debt. They have a set amount of time per the rules to file a counter claim. Make sure you know the rules. It will not be uncommon for the JDB to not file their counter claim in the allowed time frame. If they file after the allowed time, you must file a written objection noting this and ask for their claims to be stricken as untimely. Always file written objections to EVERYTHING that falls outside the rules in arbitration. When you object, also ask for a hearing on the matter (see arbitration strategies section above). NOTE: It is likey that in such situations, the arbitrator will rule in favor of the creditor almost every time and allow things like untimely filings anyway. Do not let this discourage you. The point is that you filed the objection, forced at least a response from the other side and for the arbitrator to make a ruling. All of this cost them time and money. Even if nothing goes your way on objections, you should continue to make them for every problem you encounter. They add up and they increase the pressure on a JDB (or an OC) to settle. The fact that using this Arbitration method has now reversed the roles (you are the claimant who has brought claims AGAINST the JDB) AND combined with the fact that the Court has granted your MTC, means that the JDB is now stuck between a rock and hard place. They can't just dismiss the court case on their own (they need your agreement for a stipulated dismissal because of the granted MTC) and they also can't drop the arbitration case without your agreement (not only is it not their arbitration case, but yours, but they would also be violating the court order to arbitrate). Because of this, you are now firmly in the driver's seat. The JDB does not want to spend a ton of money and time to arbitrate, but also does not want to violate the court order. This means YOU are in control of the settlement agreement. You can tell the JDB that you will stipulate to a mutual dismissal with prejudice (meaning you will dismiss your arbitration case against them with prejudice and they will dismiss the court case against you with prejudice). You win. Instructions: Be sure to read and follow the instructions for filing a case on this first page of the form. Respondent: The respondent is the JDB/OC/Creditor who sued you. They would be listed as the "Plaintiff" in the lawsuit, but are the "Respondent" in arbitration because you are the party filing the case here. Fill out the JDB/OC/Creditor's name and contact information here with the law firm or attorney's information below them in the "representative" section. If you know or can find the attorney or law firms email address to add here, it will be helpful as most of JAMS' communications after the initial filing will be by email. This can also expedite the confirmation of your case being filed in JAMS. Claimant: You are the claimant. Fill out your information in this section and leave the "representative" blank. Mediation in Advance of Arbitration: Do NOT check this box. Nature of Dispute & Claims Sought: This is the section where you can briefly list what claims you have against the creditor. Again, this can be as simple as "Federal and state consumer debt collection law violations", or listing the actual law or statute that was violated, or listing "Consumer debt dispute". Following that with something such as "Seeking Actual, Statutory and Punitive Damages". Again, I would suggest to NOT mention the lawsuit filed against you on this form. Amount in Controversy: Use your best judgement. If you have no violations to claim against them, this could be the alleged debt amount, or it could be the alleged debt amount plus $1,000 for an FDCPA violation, or the debt amount plus $2000 for an FDCPA and FCRA violation. Or perhaps you don't want to list the debt amount at all and just have 10 TCPA call violations and want to claim $5,000 (10 TCPA x $500). Again, use your best judgement. Request for Hearing: YOUR city, State. This is the location that JAMS will select should an in-person hearing take place. Election For Expedited Procedures: Do NOT check this box. Again, the entire point of this strategy is to make the process slower and more expensive for the other side. Checking this box will defeat that entire purpose. Consumer and Employment Arbitration: Check the box that says "YES. This is a consumer arbitration." Respondent #2: If you have claims against a second entity, such as the law firm representing the JDB, then you would add them as a second respondent in this section. That is all. You may leave the remaining sections blank and you are ready to file. Again, be sure to double check the requirements to file back on page 1 and follow the instructions carefully. The AAA Demand For Arbitration Form is located at https://www.adr.org/ConsumerForms This form is a little more straight forward and shorter to fill out than JAMS. The instructions for filing are located at the bottom of this single page form. I always use the email address at the bottom of the instructions to send in my AAA case filings. I print off the filled out form and my Arbitration Clause (AAA does not require the entire card agreement, only the arbitration section) and any other item you are subitting with your case. I then scan the documents to a single PDF file and attach it to my email. In the body of my email, I explain that I am submitting a new consumer arbitration case and (if stated in the card agreement) that the contract states that the business is to pay all filing fees, so I request that the business forward all filing fees directly to AAA. If you need help filling in the sections of this form, see the answers to the JAMS form above, as they are essentially very similar. 1. That on or about ___________, 2011, Plaintiff filed its Complaint against Defendant. 2. Defendant sent a letter via certified mail to Plaintiff's attorney on ____________, 2011, electing arbitration with JAMS and requesting dismissal of this case (see Exhibit A, attached). 3. 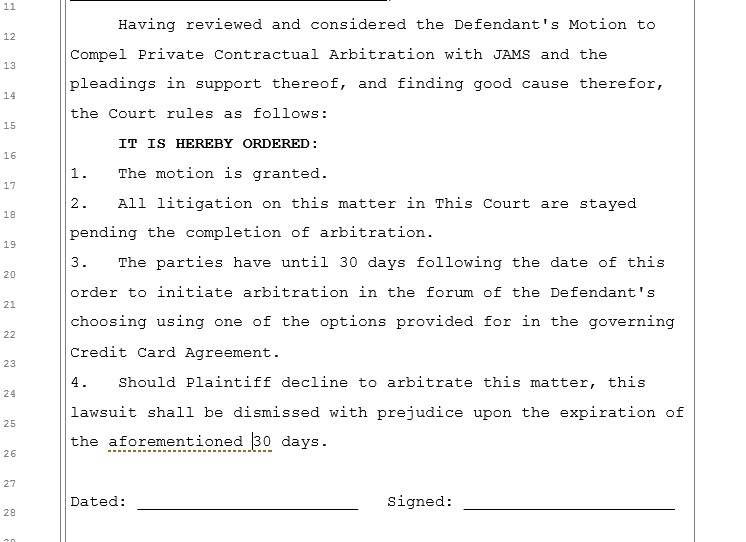 Defendant moves this court to compel binding Private Arbitration based on the terms and conditions of the Credit Card Agreement (see Exhibit B, attached). (a) YOU AND WE AGREE THAT EITHER YOU OR WE MAY, AT EITHER PARTY’S SOLE ELECTION REQUIRE THAT ANY CLAIM BE RESOLVED BY BINDING PRIVATE ARBITRATION. (b) IF YOU OR WE ELECT PRIVATE ARBITRATION OF A CLAIM, NEITHER YOU NOR WE WILL HAVE THE RIGHT TO PURSUE THAT CLAIM IN COURT OR BEFORE A JUDGE OR JURY. (d) CLAIM MEANS ANY CLAIM, CONTROVERSY OR DISPUTE OF ANY KIND OR NATURE BETWEEN YOU AND US. (e) THIS ARBITRATION PROVISION IS MADE PURSUANT TO A TRANSACTION INVOLVING INTERSTATE COMMERCE AND SHALL BE GOVERNED BY AND ENFORCEABLE UNDER THE FEDERAL ARBITRATION ACT. “A written provision in any maritime transaction or a contract evidencing a transaction involving commerce to settle by arbitration a controversy thereafter arising out of such contract or transaction or the refusal to perform the whole or any part thereof or an agreement in writing to submit to arbitration an existing controversy arising out of such contract, transaction, or refusal, shall be valid, irrevocable and enforceable save upon such grounds as exist at law or in equity for the revocation of any contract”. 6. The Supreme Court Ruling, decided April 27, 2011, AT&T MOBILITY LLC v. CONCEPCION ET U, states that courts must enforce arbitration agreements according to their terms. If there is an arbitration clause in the contract, that clause must be honored. "We have described this provision as reflecting both a “liberal federal policy favoring arbitration,” Moses H. Cone , supra, at 24, and the “fundamental principle that arbitration is a matter of contract,” Rent-A-Center, West, Inc. v. Jackson , 561 U. S. ____, ____ (2010) (slip op., at 3). In line with these principles, courts must place arbitration agreements on an equal footing with other contracts, Buckeye Check Cashing, Inc. v. Cardegna , 546 U. S. 440, 443 (2006) , and enforce them according to their terms, Volt Information Sciences, Inc. v. Board of Trustees of Leland Stanford Junior Univ. , 489 U. S. 468, 478 (1989) ." Furthermore, "The “principal purpose” of the FAA is to “ensur[e] that private arbitration agreements are enforced according to their terms.” Volt , 489 U. S., at 478; see also Stolt-Nielsen S. A. v. AnimalFeeds Int’l Corp. , 559 U. S. ___, ___ (2010) (slip op., at 17). This purpose is readily apparent from the FAA’s text. Section 2 makes arbitration agreements “valid, irrevocable, and enforceable” as written (subject, of course, to the saving clause); §3 requires courts to stay litigation of arbitral claims pending arbitration of those claims “in accordance with the terms of the agreement”; and §4 requires courts to compel arbitration “in accordance with the terms of the agreement” upon the motion of either party to the agreement . . . "
7. The Defendant elects arbitration to settle this dispute. WHEREFORE, Defendant moves this Honorable Court to compel private contractual arbitration pursuant to the Cardmember Agreement and to dismiss Plaintiff’s complaint due to Lack of Subject Matter Jurisdiction or in the alternative, to stay proceedings pending contractual arbitration. Further, this case shall be stayed pending the outcome of private arbitration. @fisthardcheese Is it possible for you to add a link to this post to your sig space? It's got such valuable info. It would also save you from having to repeat yourself a million times! 5. What About an OC? - If you are dealing with an Original Creditor (not a JDB) they may take the arbitration all the way through to the final hearing. With some OC's, they will never agree to a mutual walk away, however, using arbitration may help you get a much cheaper settlement offer than you would by staying in court. The long, slow arbitration process can also buy you time to save up a lump sum to offer them for settlement as well. If you "lose" the final hearing with an OC, check your card agreement for any arbitration appeal language. Some OCs like Discover and AmEx have an appeal option written into the contract. The appeal is before a 3-arbiter panel. This means the arbitration process starts all over again, only this time you have 3-arbitrators which triples the bank's costs. If you are dealing with an original creditor there are some that will follow this through including appeals regardless of expense. AMEX and Discover are the top 2. The goal in this type of arbitration is to get the best possible settlement. Always remember a bad case in court is equally bad in arbitration. The windows for settlement are similar to those of a JDB. If an appeal is possible it can drive the expense up but anecdotal evidence suggests that the top 2 OCs do not mind and will follow through on appeal as well. Again, you are buying time for the best settlement. This is where arbitration costs skyrockets well over $100,000. After you file an appeal and get 3 arbitrators appointed, this is likely the best settlement opportunity with an OC. (when they are staring at a new $30k initial retainer bill after just paying $50k for the first arbitration in total). There is only ONE documented case I could find where the costs escalated to that (read here: https://www.cbsnews.com/news/one-mans-100000-journey-through-arbitration/ ) and it was not the arbitration fees but the legal fees the consumer spent fighting CITI. Also, recent evidence suggests that these creditors are NOT paying a retainer fee per case as they did years ago. They are paying a global annual fee for a specific amount of representation per year including the few arbitration cases they do. It would explain why they are so willing to pursue it to the bitter end. There is no absolute proof beyond a couple of posts by consumers on various boards like this that the costs skyrocket to $100k. Nor do you have any proof of what retainer the creditors are paying either. Given their willingness to follow through my educated guess it is WAY less than the old school thought that keeps getting passed around. The entire thread is great for those who want to pursue this option but I think it is a really bad idea to include verbiage that virtually guarantees an outcome or makes claims to costs that are unsubstantiated. It should stick to the factual points. I would also consider a disclaimer on that sample motion that each person needs to thoroughly research the rules and requirements for their state and court. There is not a one size fits all answer and in 2 states Texas and Florida following that advice would get the motion denied because they have VERY specific procedures to follow to use arbitration once sued. Always remember a bad case in court is equally bad in arbitration. This is a stupid phrase that is designed to scare people away from arbitration. As I made crystal clear in this post, your case in arbitration is the same as court. It could be "bad" or it could be quite "good" too. However, neither are much relevant as the entire strategic point of arbitration is the cost and time factor that JDBs and some OCs do not want to deal with. The retainer bill is from JAMS for the services of the arbitrator. I don't care what the company pays THEIR attorney (probably next to nothing), but the JAMS costs are what this thread is all about. There is no absolute proof beyond a couple of posts by consumers on various boards like this that the costs skyrocket to $100k. There are many areas where the data backs up this fact. First, I personally have seen bills for my own cases and other people's arbitration cases showing the retainer that JAMS and AAA bill the JDBs. There are at least 2 consumers that I have personal knowledge of that have had cases where the OC was billed by JAMS in excess of $100k. Additionally, JAMS sends everyone who files an initial case a list of arbitrators to choose from. That list includes the arbitrator's hourly rates. (You would actually have to have experience in arbitration to know this and see these rates). It is not hard to do the math of multiplying that arbitrator's hourly rate, plus the JAMS Admin fees and multiply them by the hours a usual arbitration case takes. Then for an appeal, multiply that by 3 for the 3-arbiter panel. And my numbers do not even include travel, lodging, room rental, etc. None of the individual case information is going to be published because that is the entire point of PRIVATE arbitration. However, there are enough pieces made public that anyone who actually wants the objective facts can get a good ballpark idea of the figures. No such guarantee is made. Read the first paragraph. This is a guide for getting started and understanding how the strategy works. It is called a "strategy" for a reason, not a "guarantee". It is called a "sample". It is stated multiple times in my post to always check your court rules and know the rules for filing a motion. Your response can stand as yet another warning to always check your court rules before filing a motion. But now that you've chimed in, I can accurately use a more click-bait title and call this "The One Strategy that Debt Collectors Hate!" @fisthardcheese thank you for creating this post. Very helpful info for all those dealing with this. Are you by any chance in Cali? I have updated this post to include a sample Proposed Order for the MTC and also instructions for filling out the JAMS and AAA Demand Forms to start an arbitration case. Thank you so much! I don't have any specific questions but I'm sure I will soon. I am in Texas and being sued by Cavalry. assignee of Citibank. I have already answered the lawsuit and had a pre-trial hearing. At the pre-trial hearing, their lawyer agreed to send me all of their documents on the account by email. Their lawyer emailed me an affidavit, an old statement from the account, a bill of sale and a card agreement. The card agreement has an arbitration provision. I am trying to prepare a letter of intent to arbitrate, an MTC and the JAMS application to mail all at the same time. Ok, I have a question. The lawsuit was filed before the SOL ran out (barely). If the MTC is granted, the arbitration will begin after the SOL ran out. Does that matter or help me out in any way? The filing of the lawsuit tolled the SOL. In addition to what @BV80said arbitration is the one forum where the arbitrator can disregard the SOL. SOL only applies to actual lawsuits. I have already answered the lawsuit and had a pre-trial hearing. The card agreement has an arbitration provision. I am trying to prepare a letter of intent to arbitrate, an MTC and the JAMS application to mail all at the same time. Did you raise arbitration as an affirmative defense in your answer? You may have a big problem in that Texas requires that and by participating in the litigation process via the pretrial hearing and voluntary discovery you may have waived your right to arbitrate. You have nothing to lose by trying but do not be surprised if the court denies it for those reasons. If you start your own thread, you are likely to get more help on any specific issues as you go along. its this fine for a MTC? Remember, that this is now YOUR case against the JDB. It will be up to the JDB to file a COUNTER CLAIM in arbitration for the alleged debt. There was a case recently where a consumer initiated a claim with AAA (paid the $250 fee) BEFORE being sued in court. The JDB came back with a Motion to Dismiss, which the consumer objected to and the arbitrator denied. Because the consumer opened the case, the JDB couldn't refuse to arbitrate lest they potentially be in breach of the contract and in violation of the FDCPA. The JDB paid their portion of the JAMS fees and the case is now underway. It was not clear to me whether or not the JDB filed counterclaims to recover the debt, but it would be an easy thing for them to do. Since arbitration is a loss the same as if the case stays in court, the net result in this case is that the consumer essentially sued himself. The only way out would be for the consumer to propose a mutual walk away, but with arb fees being non-refundable, the JDB has little motivation to back down once they paid their fees. Furthermore, because this was with AAA, there is no $250 consumer fee cap like there is with JAMS. The only way things could turn around is if there were several hearings and appeals that would significantly drive the JDBs fees up to a point that they would agree to take a $5,000-$10,000 loss to prevent a $10,000-$15,000 loss. For this reason, I advise against initiating arbitration before being sued, unless you have claims against the JDB. I always advocate the same with very limited exceptions for filing before being sued, such as an actual "small claims exclusion" in the card agreement, as with Citi cards. However, in the case you speak of, the JDB has only paid the initial $2900 fiilng fee to AAA. There will be another bill before the hearing, which is very likely the attorneys are unaware of yet. AAA does not have as extensive of a fee structure as JAMS, so the max with an expensive arbitrator hourly rate would likely be $6000-$7000 in a AAA case. However, this sounds more like the cases we have seen a couple times where the attorneys believe the initial filing costs are the only costs to bear for the arbitration (as it would be in court), but then are surprised at the second bill and decide to settle. Also, AAA does have a consumer cap like JAMS and it's cheaper at $200. However, in the case you speak of, the JDB has only paid the initial $2900 fiilng fee to AAA. Turns out that the consumer made an FDCPA claim against the JDB, but the JDB never counterclaimed for the debt, meaning the JDB has no leverage to negotiate a settlement. It also means the JDB could technically still sue the consumer in court at a later time. Suing would not a wise move, given the propensity of this consumer to use arbitration, but it's an interesting case study to see what lengths a JDB will go to defend an FDCPA claim in arbitration. I still believe this JDB will eventually settle and the consumer could very well use it to wipe out the debt (mutual release of liability or similar). I have had 2 AAA cases settle just days before the final hearing with stubborn creditors. The fact is, no matter how boisterous they are up front, they really don't want to travel to a hearing and participate in what is just as unpredictable of a situation for them as it is for the consumer (especially when they have no counter claim). I would like to wait and see on this particular case before saying this is something JDBs may or may not do. HELP! I attempted to file a MTC today in Oregon, and the county clerk looked at me like I had two heads. She wanted to see an example of when this type of motion had been filed and grated in Oregon, because she had never seen one before. Does anyone know of any Oregonian cases? I've been trying to find some, but I'm not having a ton of luck. Additional details on the case can be found here - https://www.creditinfocenter.com/community/topic/329879-being-sued-by-cach-in-oregon-arbitration/?tab=comments#comment-1368489. They did let me file, and I have to send in some additional info next week and would love to include examples. I've already started the AAA case, so hopefully it's going to move in the right direction! I would also show the clerk section 3 of the Federal Arbitration Act. You are filing a motion allowed according to the Federal Arbitration Act. The clerk does not have the right to deny you the opportunity to file that motion. The clerk does not have the right to deny you the opportunity to file that motion. The clerk also is not the judge. Do NOT allow them to tell you what you can or can not file in your case to defend yourself. I find that behavior appalling. I have been sued but haven't been served the papers yet. I intend to file a MTC once I am served. So is it better to wait to file the arbitration with JAMS? Should I file when I file MTC? I am confused on when to actually file arbitration with JAMS. First, I would use AAA over JAMS if your agreement has the option for AAA. The consumer fees are a little lower, but more importantly the AAA rules expressly prohibit the arbitrator from reallocating the JDBs fees back to you making it that much more unattractive for the JDB to follow you into arbitration. Second, for several reasons I always tell people to wait to start arb until after they are served. One reason is you may not get served and the suit will get dismissed. The other reason is it creates a time crunch situation that can muck up the works. Say you start arb, but you don't get served for another month. Then AAA closes the file. Then you get served and will have to start the process over again. So just wait. Should I file when I file MTC? I like to wait until the judge grants the MTC before I file. However, I would have the demand forms filled out and copies with me in court just in case anything comes up about how you haven't filed yet or your seriousness about actually filing, then I can show the judge that I am in fact ready to file right now and that I am only waiting for the MTC to be granted to make the action proper. Along with your MTC it is generally a good idea to include an affidavit that testifies that the included Card Agreement you are submitting is a "true and correct copy of the contract that governs the account from which Plaintiff's allegations arise". A quick google search will show you how an affidavit should be formatted and worded. It does not have to be complicated or special, it just has to be your own words stating you have the correct card agreement. The Affidavit should be notarized before filing with the court. If I left out the Affidavit when filing the MTC Arbitration, can I file it separately or should I just wait to produce the document at the Hearing?